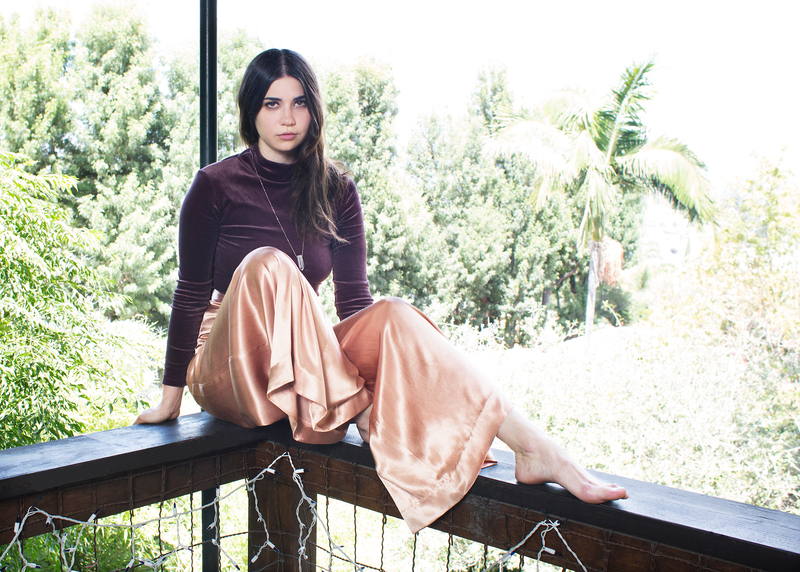 Musician Pearl Charles wearing Fulmer's silk high waisted pants on the terrace at Catherine Fulmer's Silverlake treehouse. Spend a few minutes with fashion designer Catherine Fulmer and you'll instantly realize why her music-influenced design sensibility has attracted celebrities, supermodels and influencers to flock to her line. She learned her first Metallica guitar riff at age six and sang and danced at rock concerts since she was twelve. "I've always surrounded myself and been attracted to the artists and weirdos. They're far more fun and interesting to me," she says of her creative upbringing. The California born-and-raised designers' edgy feminine style is apparent in every aspect of her line; a signature of the line is a satin bomber jacket emblazoned with "BOWIE," a nod to the musician. Catherine began designing clothes at the Fashion Institute of Technology in New York City. Some of her first pieces continue to influence her line, ten years later. "My first piece is actually framed on my wall. It's a multicolored wrap top that I still make, but in different fabrications." Fans of her line include Brooke Shields, Eva Mendes, Selma Blair, Lea Michele, and recently, Kate Moss. "I just sent Kate a package and she loved it," says Catherine. "Dream come true." Last summer, Catherine invited Story + Rain and musician Pearl Charles into the Silverlake home and studio she dubs her "treehouse" to view the collection. Charles, both a friend and fan of Catherine's, had just gotten back from a songwriter's retreat when we met her. After the pals caught up, we watched Fulmer's collection being modeled to perfection by the artist. Pearl describes her own style as "very vintage inspired", and is particularly inspired by the 1970's. And while she's a big fan of "male style", she opts for a "sexier, sparklier" look when performing on stage. Sharing the same aesthetic, it's no wonder the two creative mavens make a perfect pair of friends. Listen to @pearlcharles' "Sleepless Dreamer" here. How would you describe your line or design style? I'd describe my design style as feminine, tailored pieces with always a small touch of rock 'n roll. I generally work with very luxe fabrics and cut all samples on the body. I love washed silks and I use them in every collection. Music and my girlfriends. American Pop Culture is in a strange place right now and I miss the days where we didn't place value on things such as Instagram. I miss the days where models actually had to have something special other than just posting to an active Instagram account. Kate Moss and her vintage collection will always be up there for me. Who is the Catherine Fulmer girl? She's a 20 to 50 year-old modern and strong, but feminine woman. She knows what she wants and she likes to celebrate being a woman. She takes risks and invests in pieces rather than "outfits." Where did you grow up? Was it a creative environment? I grew up in Palm Desert, CA and went to high school in Newport Beach. Some of the best music has come from my hometown and I take pride in that. I've been around musicians my whole life. This cool-girl designer has her hand on the pulse of cool-girl style. From left to right: Taylor Velvet Ankle Socks; Zee Blouse; Aura Velvet Knee Highs; Cheyenne Velvet Dress; Rose Gold High Waisted Pant; 90’s Babydoll Dress.